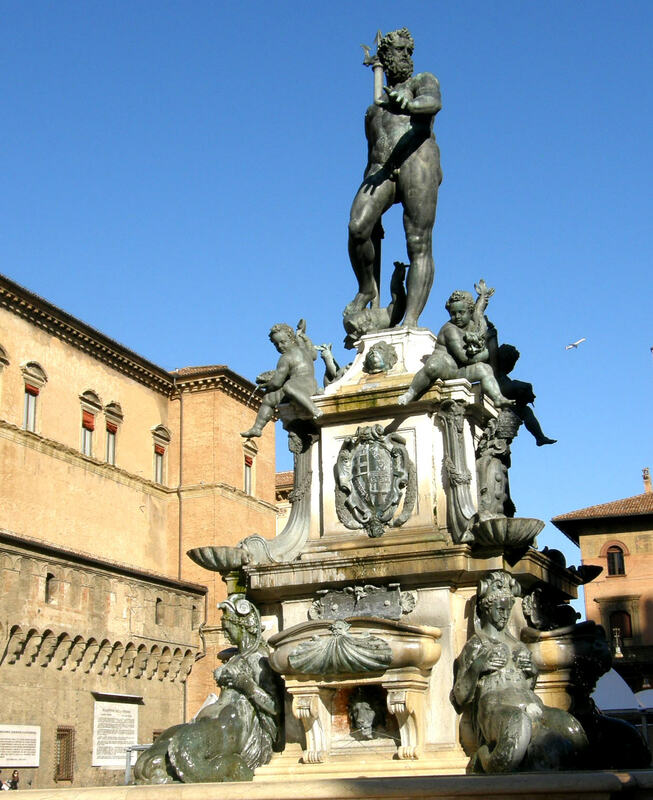 Fountain of Neptune anchors Bologna’s Piazza Maggiore. BOLOGNA —- Bologna’s location is one of its major attractions, said Na’ama, the young Israeli economist who came here to study at the oldest university on the continent. There’s also Turin, Venice, the Italian lake country, Padua, and Florence all within a two-hour train ride. After a 45-minute ride, we debarked onto the comfortably clean streets of Parma and fine-tuned our noses to hone in on a local delicacy — not parmesan cheese but prosciutto di Parma. Cut thin enough to almost see through, this version of the Italian cured ham is tender on the teeth and has a keen flavor that still lingers. The following day, we headed in the opposite direction to Ravenna, just off the Adriatic coast. Before tracking down a site to gorge on a plate of overflowing seafood, we made our way to the Basilica di San Vitale to view 1,500-year-old mosaics that reflect the town’s tenure as capital of the Byzantine Empire in Europe for three centuries. We stopped by Dante’s tomb on the way. Dante was tossed out of is native Florence after he picked the wrong side in the ongoing battle with the papacy. In exile, he wrote “The Divine Comedy” after taking up residence in Ravenna. Incidentally, you won’t find any baloney in Bologna. The model for the U.S. version of the large round ground-pork sausage is mortadella, which houses delectable chunks of fat and, when copied on this side of the Atlantic, was dubbed bologna/baloney. And the street-and-sidewalk no-baloney bustle convinced us we weren’t in the typical town when one thinks of somnolent sunny Italy. The desk clerk gave us a polite but brisk “Bon giorno.” The fellows who put together our coffees, rolls and fruit in the eating emporium down the street must have known we weren’t fully awakened to local prices. The bill for a banana was more than $4, which taught us quickly to ask the locals where they munch. The clerks in the bank where I set off alarms by trying to exit through the wrong door did not take operatic offense. They just politely pointed me to the designated door without much more than a polite shrug. The point is, Bologna is as much business as badinage. But it’s still as much about food as finance. For our introduction to what Bolognese boast about — tortelloni made on the premises — we checked with merchants in the old quarter. A florist suggested Trattoria da Gianni, a hole in the wall down a little alley that we would have overlooked. The proprietor ushered us to a table crammed amongst many jammed with men and women in office attire who gathered here for the same reason we did. The fine food. After getting fortified with the local specialty, we moved on to visit the two leaning towers that anchor the historic downtown. While not as attractive nor as storied as Pisa’s I Torre Pendente, these two monoliths lounge unruffled by the hurrying hordes and beeping buses rumbling around their bases. They appear more attuned to the music and musings that emanate from the nearby University of Bologna grounds, where Copernicus and Dante once scurried to class. There’s an outdoor market every Friday in the Piazza dell’ VIII Agosto on the rim of the commercial hub that offers everything from boots to bracelets. Merchants in the nearby market-and-bakery complex display an array of fruit, vegetables, breads and sweets to match all the sights and scents of one’s dreams. Among them we found a fist-sized roll with thumb-sized studs poking out in all directions. They appeared on our table at Trattoria Fantoni, another enticing hole-in-the-wall eatery, where we watched other diners break off these protuberences and eat them as breadsticks.